Marines of the Corporal Johnny A. Williamson Detachment #1165, Marine Corps League gathered together with guests at the Pinewood Country Club on the evening of November 5'th to celebrate the United States Marine Corps 241st Birthday which is November 10th. Marines celebrated time honored traditions of reading of the Birthday Message from the Commandant of the Marine Corps, General Robert B. Neller and a cake cutting ceremony recognizing the oldest and youngest Marine present. Guest of Honor/Speaker was Steven Underwood USMC Retired. A great meal and evening was had by all. 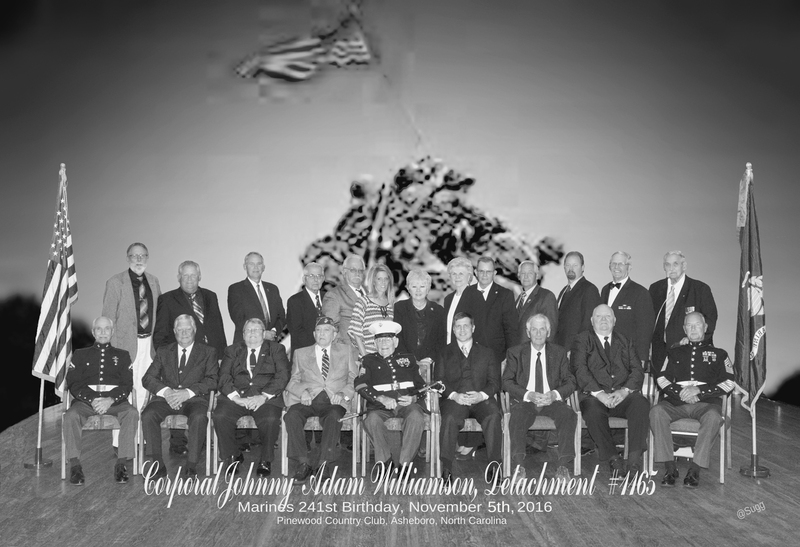 The Corporal Johnny A. Williamson Detachment was chartered in 2004 this year they are celebrating their 12th year anniversary and they currently have approximately 50 members. They meet the third Tuesday of every month at 7:00pm at The American Legion Post 45 located at 419 Lanier Avenue, Asheboro. Membership is available to all honorably discharged, retired, or active duty Marines as well as FMF Navy Corpsmen. For more information contact Senior Vive Commandant/Newsletter Editor Harvey Allred at 336-629-8132. Sitting left to right: Dana Hughes, Paymaster Filmore York, Commandant Danny Wood, Bill Husband, Oldest Marine present John Coltrane (Roy) age 94, Guest of Honor/Speaker Master Sergeant Steven Underwood USMC Retired, Historian Carlton Cheek, Chaplain Ron Williams and Senior Vive Commandant Harvey Allred. Standing left to right: Photographer Steve Sugg, Sgt-at-Arms Gary Caviness, Ty Hall, Sam Bogosian, Lucky Luckado, Associate Members Kelli Jones, Zoe Faircloth, Elizabeth Nault, Adjutant Bill Petty, Judge Advocate Wally Waldridge, Youngest Marine Present Mike Ingold, Junior Vice Commandant Chuck Zimmerman and Richard Markvart,. Nov 2017 - Jan 2018 Newsletter. Oct - Dec 2017 Newsletter. Sept - Dec 2017 Newsletter. Aug - Nov 2017 Newsletter. July 2017 - Nov 2017 Newsletter. June 2017 - Sept 2017 Newsletter. May 2017 - Aug 2017 Newsletter. April 2017 - June 2017 Newsletter. March 2017 - June 2017 Newsletter. Feb 2017 - May 2017 Newsletter. Dec 2016 - March 2017 Newsletter. Nov 2016 - Jan 2017 Newsletter. Oct - Dec 2016 Newsletter. Sept - Dec 2016 Newsletter. June - Sept 2016 Newsletter. May - Aug 2016 Newsletter. April - June 2016 Newsletter. December 2015 - March 2016 Newsletter.